This report continues to represent the broadest survey of institutional voting ever done on the topic. The largest fund managers, in terms of Assets Under Management (AUM), appear to be the most reluctant to vote against compensation packages. While both BlackRock and Vanguard have finally begun to speak out on the issue, their votes do not reflect this. The typical mutual fund with $500 billion or more in AUM (there are 19 of them) voted against 12% of the CEO pay packages in the S&P 500, yet Blackrock and Vanguard voted against only 3%. Large non-US investment managers and pension funds are more likely to vote against CEO pay packages. Non-US funds increasingly recognize that CEO compensation at US companies reflects a broken system. Allianz, headquartered in Germany, voted against 79% of the overpaid CEO packages. Natixis a privately-owned asset management holding company based in Paris voted against 46%. PGGM, a leading Dutch pension administrator with $251.6 billion in assets, voted against 97.2% of all CEO pay votes at S&P 500 companies. Institutional shareholder votes on pay vary considerably, with pension funds far better at exercising fiduciary responsibilities. Again, this year we found that pension funds are more likely to vote against overpaid compensation packages than mutual funds. Several voted against more than half of the overpaid CEO pay packages; a few came close to voting against half of the entire S&P 500. On the other side of the spectrum, we also highlight the Pennsylvania State Employee Retirement System which voted to approve every CEO pay package at every company in the S&P 500. The companies with overpaid CEOs we identified in our first report have markedly underperformed the S&P 500. Last year we did an analysis exploring how firms’ stock value has performed since we first identified the CEOs as overpaid. Last year we reported that the 10 companies we identified as having the most overpaid CEOs, in aggregate, underperformed the S&P 500 index by an incredible 10.5 percentage points and actually lost shareholder value with a negative 5.7 percent financial return. The trend held true as we added an additional year’s data. Again, this year, the 10 firms with the most overpaid CEOs, in aggregate, dramatically underperformed the S&P 500 index by an embarrassing 15.6 percentage points. How do funds vote on the Most Overpaid 100 CEOs? Click the buttons to sort. Financial managers often rely on proxy advisors to evaluate CEO pay packages. The two largest advisors, Institutional Shareholder Services (ISS) and Glass Lewis, compete with several smaller advisors like Egan Jones, Segal Marco, and PIRC. ISS recommended voting against 10% of the CEO pay packages at S&P 500 companies, and 38 of the 100 most overpaid CEOs. Glass Lewis recommended shareholders vote against 14% of CEO pay packages out of all the S&P 500 companies, and 42 of the 100 overpaid CEOs. Segal Marco Advisors, which provides proxy voting services to multi-employer and public pension funds, recommended shareholders vote against 43% of pay packages at S&P 500 companies 57 of the overpaid CEOs. PIRC, one of the largest proxy advisors in Europe recommended votes against at 58% of S&P 500 companies. They recommended voting against 67 of the companies with the lowest votes, and abstained on the remaining 32 in its portfolio. A number of funds, BlackRock and Vanguard among them, have defended their lack of voting opposition to a philosophical preference for engagement, believing that the most effective way to shift corporate governance is through dialogue. There is no way to verify whether these negotiations are having a meaningful effect on pay magnitude or specific pay practices and in fact the trends over time suggest they are not. Engagement without voting in opposition is practically meaningless as the New York Times reporter Gretchen Morgenson reported in her April 15, 2016 piece “BlackRock Wields its Big Stick Like a Wet Noodle on CEO Pay.” The votes are the only real way mutual fund clients and pension fund participants can evaluate how seriously these financial managers take this issue. Again, this year we have analyzed how the largest investors in S&P 500 companies, namely mutual funds, ETFs, and public pension funds, have voted their shares on this issue. This enables us to see which ones are exercising their fiduciary responsibility and which are acquiescing to management in squandering company resources. The mutual fund section of the report was based on data provided by Fund Votes, which has been tracking institutional proxy voting for more than 10 years. An explanation of the Unique Vote count methodology they use can be found in Appendix D.
In our first report, four years ago, there were only four large mutual fund groups that voted against 30% of the overpaid packages. Now, two years later, the number of large fund groups that exercise their fiduciary responsibility and vote against 30% of overpaid packages has tripled and stands at 12. However, as can be seen in Figure 3 below, some of the very largest funds have the worst record of voting against pay packages. Data provided by Fund Votes. See Appendix D for a full list as well as an explanation of the methodology used in calculating votes. However, as can be seen in Figure 4, funds that automatically support compensation packages are now the exception. This year there were 25 funds that voted against more than half of the 100 overpaid CEOs. Several of these are social investment funds. As can be noted from the table above, non-US fund families have the highest levels of voting against. 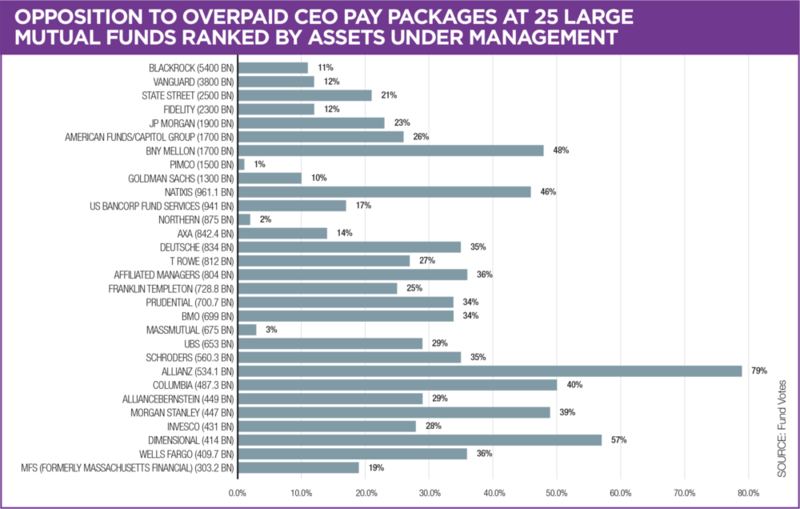 Natixis, which also appears on this chart with a high level of opposition to these CEO pay packages is a privately-owned asset management holding company based in Paris, France. As we will see, the same trend of higher opposition when U.S. CEO pay is evaluated by those outside the U.S. is evident with pension funds as well. In a recent and much commented on letter to companies, Blackrock CEO Larry Fink wrote, "In managing our index funds, however, BlackRock cannot express its disapproval by selling the company's securities as long as that company remains in the relevant index. As a result, our responsibility to engage and vote is more important than ever. In this sense, index investors are the ultimate long-term investors - providing patient capital for companies to grow and prosper." Blackrock votes against only 11 of the 100 Overpaid CEO pay packages. Out of the S&P 500 companies Blackrock voted on between 7/1/2016 and 6/30/2017, they opposed only 3.4% of packages and voted in favor at 92.7%according to Proxy Insight data. The prior year they supported 98.3% and opposed 1.7%. From 2014 to 2015, Blackrock cast votes against pay packages at less than 1% of the companies it held in the S&P 500 index. It is good to see improvement, but despite this improvement they are way below their peers. Vanguard voted against only 12% of the 100 Overpaid CEO pay packages. Out of the S&P 500 companies itvoted on between 7/1/2016 and 6/30/2017, Vanguard only opposed 3.3% of the packages, while approving 96.5%. The prior year it opposed 1.8 percent. State Street voted against approximately twice as many as Blackrock and Vanguard; voting against 21% of the Overpaid CEO pay packages and 6% of all S&P 500 companies this year. In May 2016 SSGA had reached out to companies with concerns regarding compensation in a document, entitled, "Guidelines for Mitigating Reputational Risk in C-Suite Pay" noting that "Given the growing income inequality in the country, SSGA sees increased reputational risk arising from the high quantum of pay to C-Suite executives." Thus the voting record has been much better than BlackRock or Vanguard, but Rakhi Kumar, head of corporate governance at SSGA explained to the Financial Times in early February that approximately 300 of those it voted in favor of received "qualified support." In past seasons, there were times that a concern about structure or lump sum caused discomfort, but didn't rise to the level where SSGA wanted to oppose the pay package in its entirety. This year when the fund has serious reservations instead of voting for such packages it plans to abstain. "It's something typically we supported with a heavy heart," Kumar told the Financial Times, "that will be more transparent now." Among funds with over $1 trillion in AUM, BNY Mellon had the best voting record. It voted against 48% of the Overpaid CEO pay packages and 27% of CEO pay packages at the S&P 500 companies it holds. BNY Mellon votes proxies for a number of funds, including Wisdomtree Funds and Lattice Funds. In prior years we listed each fund separately. Their guidelines appear to be thoughtfully written, likely by someone who understands issues around compensation rather than put together by a committee of people compiling what they understood to be best practices. BNY Mellon warns that it "looks for value creation rather than actions that artificially inflate share price in the short-term." In terms of pay quantum, "The firm is aware of outsized compensation packages that are not tied to extraordinary innovation, growth or other shareholder benefit." Dimensional voted against 57% of the Overpaid CEO pay packages and 18% of CEO pay at all S&P 500 companies this year. Its level of opposition has grown perhaps more than any other fund we cover. In our first report the fund voted against 20% of overpaid CEOs; in our second 46%; in our third 53%. Dimensional's proxy voting guidelines outline five principles used in executive pay evaluation, including avoiding "arrangements that risk 'pay for failure': This principle addresses the appropriateness of long or indefinite contracts, excessive severance packages, and guaranteed compensation." TIAA-CREF stands for Teachers Insurance and Annuity Association - College Retirement Equities Fund. Though the name has changed over the years, its role as a financial service company serving educators remains unchanged. In 2014 TIAA acquired Nuveen, and in 2017 it took the brand name Nuveen for all asset management business including its 12 investment affiliates. TIAA Investments, however, remains the largest affiliate and makes up 85% of public equity AUM. TIAA voted against only 3% of CEO pay packages at S&P 500 companies, and 9% of those at Overpaid CEOs. A spokesperson from Nuveen told us in an email that the "focus of the dedicated group that oversees voting on behalf of TIAA Investments is actually to influence corporations through proactive engagement and discussion with management teams and boards regarding the best practices we like to see adopted by the companies in which we invest." A few other investment affiliates continue to cast proxy votes, typically following ISS guidelines according to the spokesperson, and the disclosure for those funds (under the name Nuveen) lines up almost exactly with votes 9.6% of all S&P 500 CEO pay votes it cast, and 44% of those at Overpaid CEO companies. As can be seen from Figure 5, pension funds typically have a higher level of opposition to overpaid CEOs. The opposition level to the overpaid CEOs was more than 50% at 15 of the funds. As with mutual funds, non-US pension funds had the highest levels of opposition. Of the Canadian funds, Alberta Investment Management Corporation (AIMco) and British Columbia Investment Management Corporation (bcIMC) both had opposition levels over 70% on the overpaid CEO packages. PGGM, a leading Dutch pension administrator with $251.6 billion in assets, voted against 97.2% of all CEO pay votes at S&P 500 companies. The Northern Ireland Local Government Officers Superannuation Committee (NILGOSC), with $7.3 billion in AUM, held over one fifth of the companies in the S&P 500, and voted against pay at 94% of them. In addition, several UK pension funds use the voting services from Pensions and Investments Research Consultant (PIRC). Among these are the pension funds are Lancashire County, Suffolk County, Islington Council, North Yorkshire Pension Fund, and others. It is very likely, then, that these funds would have voted against 62% of Overpaid CEO packages. Norges Bank is the largest sovereign wealth funds (SWF) in the world. SWFs are created with government money, typically from earnings on natural resources (in this case oil). The fund, created by the government of Norway in 1990, has taken some progressive stances on climate and other issues in recent years. Norges opposed CEO pay packages at only 6% of the companies in the S&P 500. Its voting record stands in stark contrast to those of other European funds. As can be noted in the above figure, many pension fund votes settle around the level of opposition of the leading proxy advisors at these companies, 44% and 54% for ISS and Glass Lewis, respectively. This suggests they may simply vote the guidelines directly. The University of California is not listed above because we were unable to get their records, but follows ISS’s recommendations. However, more and more public pension funds are showing keener analysis and voting against companies even where the advisors recommend in favor. One pension fund that stands out is the Florida State Pension Fund. This fund which is administered by the Florida State Board of Administration (SBA), voted against 41% of CEO pay packages of the S&P 500 companies; they voted against 73% of the 100 Overpaid CEO pay packages. Some of the language in the SBA guidelines is similar to that of other investors; calling for proper alignment of pay and performance, better disclosure and so forth. But the SBA sets the tone for voting in its guidelines: “SBA look for reasonable compensation levels, both on an absolute basis and relative to peers.” The fund notes that “high compensation levels on absolute or peer-relative basis” may cause a vote against a compensation plan. The fund lists approximately 20 other practices or concerns that may result in a vote against and advisory pay vote, providing a fair level of specificity. For example, it notes that “poor disclosure of performance metrics, thresholds and targets” may result in a vote against, rather than simply listing generic “poor disclosure” as a concern. The SBA is one of the funds that discloses the rationale for its voting on its website, where that data is collected by Proxy Insight. Using that data, we were able to investigate a sampling of its votes. The rationale we found that was used most often was that a company “received a grade lower than a C in the Pay for Performance model.” (This was the rationale for votes against Bed, Bath & Beyond, ConocoPhillips, Freeport, Mylan, and SL Green Realty among others). Of the public pension funds, LACERA is one that has shown the most improvement since last year. It went from voting less than 7% of S&P 500 companies last year to more than 10% of S&P 500 companies in its portfolio this year. The fund voted against 10.3% of pay packages of the S&P 500 companies; they voted against 35% of the 100 Overpaid CEO pay packages. There are a number of New York City Funds that together, under the Bureau of Asset Management at the Office of the Comptroller Scott Stringer, have a division called the Corporate Governance and Responsible Investment that casts votes and leads governance initiatives. The fund voted against 26% of pay packages of the S&P 500 companies and against 67% of the 100 Overpaid CEO pay packages. The fund, which manages pension and health benefits for more than 1.6 million California public employees, retirees, and their families, has long been a corporate governance leader. CalPERS voted against 16.5% of pay packages of the S&P 500 companies; they voted against 53% of the 100 Overpaid CEO pay packages. CalPERS opposition level to pay packages has been increasing at a slow by steady rate since 2012, when they opposed only 6% of pay packages. CalSTRS, the largest teacher retirement fund in the United States provides retirement and other benefits for nearly 1,000,000 California educators. The fund voted against 17% of pay packages of the S&P 500 companies; they voted against 61% of the 100 Overpaid CEO pay packages. The Amalgamated bank was founded by the Amalgamated Clothing Workers of America in 1923. In 1992 the Amalgamated Bank introduced its LongView Equity Index Fund, which provides union pension funds with investment products and actively advocates for enhanced shareholder value. Amalgamated Bank voted against packages at 43% of pay packages at S&P 500 companies and 57% of the overpaid CEO packages. The 100% support means that it voted in favor of the pay package at Mylan, making it the only public fund that supported it. This vote is also in contrast to voting patterns of other funds in the same state, including Pennsylvania Public School Employees Retirement System, which voted against 17% of the Overpaid CEOs packages. Following up on the As You Sow report regarding shareholder votes on CEO pay, ISS has indicated that due to an internal miscommunication within the ISS team, it incorrectly executed “Say on Pay” votes on SERS’ behalf. ISS has confirmed the erroneous votes did not change the final result of any of the impacted voting items. As a result of identifying the error, SERS has been advised that an additional layer of review and sign-off has been added to the controls ISS currently has in place regarding the implementation of policy changes. Additionally, ISS and SERS will be setting up quarterly calls to review the proxy votes taken to ensure that the votes are in compliance with the SERS Proxy Voting Policy and current best practices. Furthermore, the call agenda will include any other current action items, governance matters of interest, and other topics related to the services ISS is providing to SERS. This year for the first time in the report we are including a table that allows readers to view results from specific votes at particular companies. On the list we included a number of examples of prominent companies with evidence of overpay or problematic practices. We did not include votes at several companies where all advisors recommended against: Alphabet, Chesapeake, Mylan, Oracle, and SLGreen. General Electric’s compensation package serves as one example. It was supported by 89.2% of investors. Since that vote, the company revealed that the SEC is investigating accounting charges the company took following vastly under estimating the costs of long-term care and other policies. By February 2, 2018 the stock was down 40% from one year earlier. Well before this broke, several investors – primarily large pension funds -- had various concerns about compensation and voted against the advisory vote. The largest investor in GE that voted against the CEO pay package was its 4th largest shareholder, Capital World/American Investors. The chart of mutual funds below, however, shows that while some large funds voted against these excessive packages, there were some who voted for the majority. As can be seen from the following chart, Pension Funds were more likely to vote against Overpaid CEO pay packages than were the mutual funds. The Dodd-Frank Financial Reform Act gives shareholders the right to cast an advisory vote (Say-on-Pay) on CEO pay packages. Institutional investors, having the fiduciary responsibility to represent asset owners and pension beneficiaries need to use this right to make a statement that the system is out of balance and they want change. In addition, those who own mutual funds through 401(k)s and other investment vehicles must hold fund managers accountable and insist that representatives also exercise this responsibility rigorously. The waste of corporate resources impacts not only the company but polarizes society at large with far reaching implications on the economy. Shareholders have the tools to have their voices heard. Now they need to use them. This table shows the 100 Most Overpaid, as calculated by just the HIP Investor regression analysis. Although we, like many other analysts, find weak links between pay and performance, the usual justification claimed for high executive pay is that they are connected to profits and capital appreciation for the shareholders. We grant the assumption that pay should be determined by performance, and then use a basic statistical technique to map actual performance outcomes to predicted levels of pay. This prediction is compared to actual pay, to see how much the package exceeded such a prediction. Those with highest excess are ranked in the table below. • Raw data: Simply looking at every ISS-identified executive’s pay package, in each year, as a single data point to be paired with performance for that year. • CEO Pay, all years: The raw data is filtered based on ISS identification of the CEO, we adjusted Alphabet manually to make sure the CEO of Google (Sundar Pichai) is listed instead of Larry Page the CEO of Alphabet who only gets nominal pay. The series is supplemented using a Thomson Reuters Asset4 data set that captures the single largest pay package for each (company, year) pair. If ISS did not report a CEO for a given pair, and that pair was available in the Asset4 series, the Asset4 data was included. Where ISS identifies multiple co-CEOs, their pay packages are added together. Once the full set of pay packages is assembled, each (company, year) value is paired with the performance for that year, and this full set is used for the regression. • CEO Pay, most recent available: Rather than using all (company, year) pairs, only the most recent available CEO pay package is used, along with performance trailing from that year. • Summed: Aggregating all money paid out to ISS-identified executives for the year. • Averaged: Dividing the previous summed data point by the number of distinct executives for the year. Each type of executive pay could be reported in any year from 2007-2017, though not every company was reported for every year. • Return On Invested Capital (cash flow available to pay both debt and equity capital owners, adjusted for tax effects, divided by the total value of that capital). ROIC is sourced from Thomson Reuters WorldScope, which sources data from companies’ annual reports and investor filings. • Total Return (capital gains and dividends) on the company’s primary equity. This is calculated from the ThomsonReuters DataStream Return Index series, using trailing periods behind June 30 of the year of the pay package as identified by ISS (or matching the year for the supplementary largest package data from Asset4). Both performance factors were calculated across one-year, three-year, and five-year windows, trailing behind each possible pay year. This table summarizes over 100 mutual fund families on their CEO pay votes at all S&P 500 companies and the 100 companies with the most overpaid CEOs. In order not to overweight votes on securities held more widely across a fund family compared to those held by only a few funds, each vote is recorded only once across a fund family. The ‘effective unique vote’ with respect to a specific resolution is the vote cast by at least 75% of funds across the entire fund family. In most instances, all funds across a fund family will vote identically. The 75% threshold is applied in cases where one or more funds within a family of funds vote inconsistently. Fund Votes’ Jackie Cook believes that the effective unique vote count method provides the most accurate method of analyzing a fund group’s position. Where the 75% consensus threshold is not met, a ‘Mixed Vote’ is assigned and not counted as contributing to that fund’s overall level of support for Say-on-Pay resolutions included in the survey. Large companies continue to boost CEO pay, to levels that are 300x the average worker. The most overpaid CEOs collect more than 1000 times the average worker pay. While defenders of high CEO pay contend that the rewards are for increased shareholder value, the truth is clear: shareholders of companies with most overpaid CEOs typically underperform the stock market. The first edition of As You Sow’s Most Overpaid CEOs report, published in 2015, identified the 100 leaders of firms significantly overpaying their chief executives. Advocates of high CEO pay contend that pay was high at these companies as a reward for high shareholder returns. However, as seen in Figure 1, the average annual total shareholder returns in the 3 years prior (2/28/2012 to 2/28/2015) to a high pay package was essentially the same as it was at companies without the same levels of excess pay. Then, in the nearly 3 years since (2/28/2015 to 1/1/2018), the group of companies with the most overpaid CEOs underperformed the S&P500. If savvy investors sold, shorted or underweighted the100 most overpaid firms, they would have earned more than the stock market average. When we look at the quantitative evidence, pay for performance is basically a myth. Our HIP Investor team analyzed multiple financial indicators over different timeframes for all S&P500 companies and consistently found extremely low correlations (single digit correlation coefficients) between CEO pay and historical financial performance – whether 1-, 3- or 5-year performance for financial ratios including Return on Equity (ROE), Return on Invested Capital (ROIC), and Total Shareholder Return(TSR) including capital gains and reinvested dividends. Unbundling the most overpaid 100 into the worst decile of 10 firms, the remainder of the worst quartile, and the remaining three quartiles, most segments underperformed the S&P500 market average. Again, this year, the worst 10 firms with massively overpaid CEOs destroyed shareholder value, losing money for investors – and dramatically lagging the market by an embarrassingly negative -15.6%. – and this even in one of the longest bull markets in history. Surprisingly this year, the segment of companies in the second-worst quartile (ranked 26 to 50) in our 2015 report did outperform the S&P500. Three companies are major contributors to that outperformance, with annualized 3-year returns above 20% per year. Three firms -- Northrop Grumman, Lockheed and Visa – dramatically reduced the level of CEO pay since 2015. In Figure 3, you can see the rank of Overpaid CEOs drop by 65, 93, and more than 145 ranked positions – meaning, they improved by falling lower on the most overpaid list. Corporations and boards are starting to react to mounting pressure and empirical validation of more sensible pay for CEOs. For consistency of the Most Overpaid 100 methodology, HIP Investor also analyzed the 2-year performance from the 2016 report until 12/31/2017, as seen in Figure 4, with similar results: the most overpaid CEOs underperform financially. Are Overpaid CEOs a reliable indicator of financial under-performance? The evidence is compelling. Such disappointing returns are extremely unlikely. If 10,000 everyday investors chose 10 companies randomly from the S&P 500, only 8 of that 10,000 would have done worse than a portfolio comprised of the Top10 overpaid (a less than 1 in 1,000 frequency). This clearly shows that overpaying your CEO is a significant indicator for future underperformance – which we have focused on at HIP Investor since our founding in 2006. Your portfolio is your money. The companies and funds you invest in should be listening to you. However, the most overpaid CEO pay packages are approved by Boards, elected by you the investor, and the mutual funds who hold their stocks. We encourage you as investors to speak up, vote your “say on pay,” and pressure the companies and funds in your portfolio with this evidence – which can benefit your long-term financial performance and a more appropriate level of rewards for results achieved. 1 Proxy Insight, "Retaking the Wheel: ISS auto-voters take action to become even more passive," Proxy Monthly Volume 4, Issue 5 (July 2017) 6-7. This is the fourth Most Overpaid CEOs report that Rosanna Landis Weaver has written for As You Sow. Her corporate governance career began with a position in the Corporate Affairs office at the International Brotherhood of Teamsters in 1992, supervising research on corporate governance and management practices. She joined the Investor Responsibility Research Center (IRRC) in 1999 and served as an expert on labor shareholder activism, writing reports on labor fund activism, compensation-related shareholder proposals, and golden parachutes. At Institutional Shareholder Services (ISS), which she joined in 2005, she worked on the executive compensation team as a senior analyst until 2010, with a particular focus on change of control packages, and analyzed Say-on-Pay resolutions. From 2010 to 2012, she was governance initiatives coordinator at Change to Win. Rosanna holds a BA in English from Goshen College and a Masters in American Studies from the University of Notre Dame. This report was made possible by the generous support of the Stephen Silberstein Foundation. Additional support was provided by the Arntz Family Foundation, The Keith Campbell Foundation for the Environment, Firedoll Foundation, Hanley Foundation, The Libra Foundation, Manaaki Foundation, New Belgium Family Foundation, Roddenberry Foundation, Roy and Patricia Disney Family Foundation, and Singing Field Foundation. Many components of this report, including the section on pension funds, were based on data provided by ProxyInsight. The website was invaluable and Seth Duppstadt and Sophia Miles were prompt and patient with answering specific questions. The HIP Investor team conducted a regression analysis, upon which a key component of this report rests, and provided measures used in the sustainability section of the report. HIP, founded in 2006, rates 75,000 investments on all aspects of sustainability (including corporate CEO pay) and how it correlates to future risk and return potential. Onindo Khan, Director, Impact Analytics and R. Paul Herman, HIP’s CEO and founder, were extraordinarily helpful and responsive throughout the process. Much of the mutual fund section of the report was based on data provided by Fund Votes, an independent project started in 2004 by Jackie Cook (CookESG Research). Fund Votes tracks institutional proxy voting and Jackie Cook’s knowledge of mutual fund families and voting practices has been of great assistance. Economist Susan Holmberg served as a research consultant on this project. Her thoroughness and attention to detail were extremely valuable. Steven Clifford, for his fantastic book, “The CEO Pay Machine: How it Trashes America and How to Stop It,” and for participating in our webinar. The As You Sow team; (alphabetically) Andrew Behar, Betsy McMahon, Cody Mitcheltree, Cyrus Nemati, and Zoey Olbum as well as our interns. Thanks also to digital designer Sarah Weingust, copy editor Miriam Holzman-Sharman, John Opet of Art270, and Royce Wells of Comrade agency for his work on website creation. The aggregated information comprising The Most Overpaid CEOs 2018 represents a snapshot in time of publicly available information regarding shareholder voting with U.S. public companies that may be on the proxy statements and voted on at annual general meetings in 2017. The information provided in The Most Overpaid CEOs 2018 is provided “AS IS” without warranty of any kind. As You Sow makes no representations and provides no warranties regarding any information or opinions provided herein, including, but not limited to, the advisability of investing in any particular company or investment fund or other vehicle. While we have obtained information believed to be objectively reliable, As You Sow or any of its employees, officers, directors, trustees, or agents, shall not be responsible or liable, directly or indirectly, for any damage or loss caused or alleged to be caused by or in connection with use of or reliance on any information contained herein, including, but not limited to, lost profits or punitive or consequential damages. Past performance is not indicative of future returns.